Flora Fauna’s Mermaid Kisses had a jar. So those who’ve been around here a while will know…I had to put stuff in them! (I may need a playlist for all my glass-jar videos soon!) 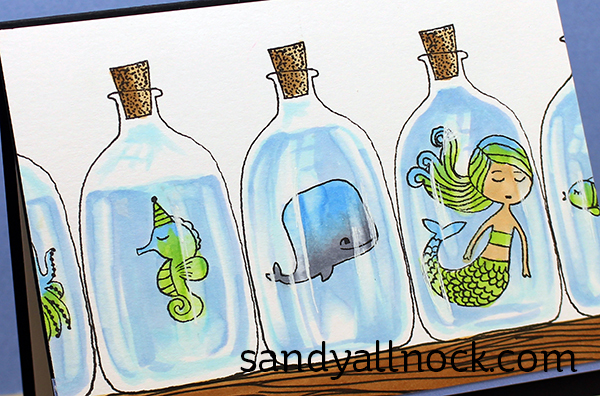 In today’s video I give you some tips for coloring glass jars….hope you enjoy it! Watch the video below or click HERE to see it in HD on YouTube. Beautiful and so realistic, and then I mean the jars (LOL), but I think you will now that. I don’t have Copics but Zig Clean Color Real Brush Markers, and I wil try this great technique with them. So Thanks again for a wonderfull video! Love this, you work magic on these types of scenes! I began to say please draw eyes onto the mermaid so she hasn’t ‘expired’ but then thought it may be worse to think she was going to die before I could jump up and rescue her. Then I told myself, the whale is going to perish also so why get upset about one creature over another? Then I saw the expired seahorse. This should be a halloween post LOL. The jars do look so realistic and I’m very glad you have shown us this way to make them look real. I made jars with eyeballs last year for halloween and used your technique. They were really gruesome. 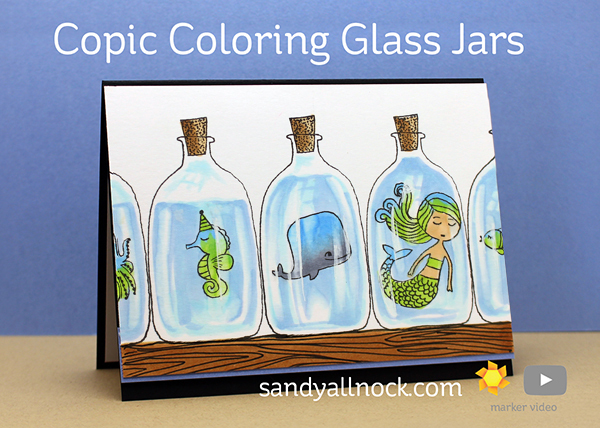 Sandy, this video was so helpful for achieving that dimensional look on the glass jars. The technique is so versatile. The card design itself is so delightful with the sea creatures sharing some common coloring. Thanks for sharing it all. Love your bottles – and my jars and bottles and vases have become a lot more believable since you started showing us how to do the reflections and other stuff in them! Just yesterday I ordered the corn candy filler for my squatty little Lawn Fawn jar stamp – love finding things to put in it – and now I can do some for Halloween, too. Who has more fun than card makers!?!? !